One of the most traditional type of window found in period properties is the sash window. It’s likely we’ve all seen a sash window, they are usually split into two horizontal sections and these sections can be pushed up or down to open either the upper or lower window. If you are thinking of having a sash window installed there’s some terminology used which you might not understand. This article will try to explain some of the common terms. This if the moulding which covers the box frame, joint with the wall. Architraves are also used around doors. Sometimes referred to as a ‘jamb’, the main box frame consists of three timber linings. This is the lower rail on the bottom sash which is generally deeper than the other rails to compensate for the depth of the cill. This is the short extension which features at the edges of the sash. In the past, it was used to strengthen the frame joints but in new windows it is generally just a decorative feature. A vertical or horizontal framing member that divides the glass panes within the stiles and rails. Each is rabbeted – a cut which forms a groove – to hold the single-paned glazing. The quintessential Georgian sash window has ‘six over six’ panes, but other configurations were seen over time. A horizontal board fitted internally at the base of the sashes. Shaped so that water flows away outside. It is normal for water to accumulate in the cill and track. The water is intended to drain to the outside via the drainage system. This is another name given to the thumb catch which is used to lock the window. It fits between the two windows. 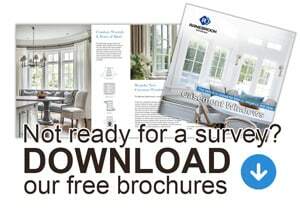 You can choose different style fasteners for your window according to your preference. Restrictors are for preventing the window from opening beyond the Stop when set/inserted to the operational position, allowing the window to be slightly opened for ventilation and security. 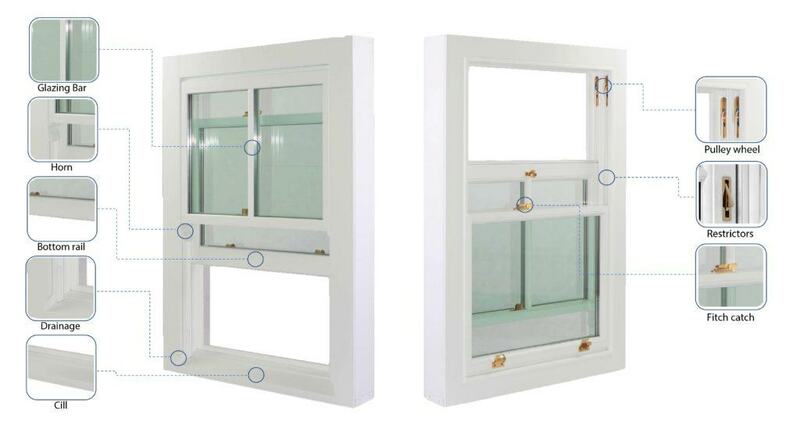 Trickle vents are small openings integrated into window frames to provide minimum ventilation requirements. They help to prevent and cure damp and mould around windows. This is the ‘pocket’ in the side of the window where the sash weights are held. The weights hang in pockets on each side of the window. A pulley is installed at the top of the frame; the sash cord passes over it to counterbalance the weights. Cheaper pulleys have plain axles; better quality ones are made with roller or ball bearings. These are the weights that sit in the pockets and act as a counterbalance for the window. This is generally the new way of counterbalancing sash windows. Instead of the weights and the pulleys, a spiral mechanism is fitted into the frame and tensioned to hold the weight of the windows. The names given to different parts of a sash window may change slightly between different countries but one thing remains the same – the beauty that a sash window can bring to a home.